2. Asparagus: Choose fresh asparagus. Steam to perfection, grill it, or add to your favorite salad. The fiber will help to melt pounds. No butter, no additives (definitely no bacon), to make asparagus a zero-calorie food. 3. Mushrooms: Not everyone likes mushrooms, but for those who do, you have chosen wisely! Mushrooms are versatile, nutritious, and good for you. There are so many varieties to choose from. One slice of a raw white mushroom is only 1 calorie. 4. Cucumbers: Sliced in onions and vinegar, or diced for a salad, you can’t go wrong with cucumbers. 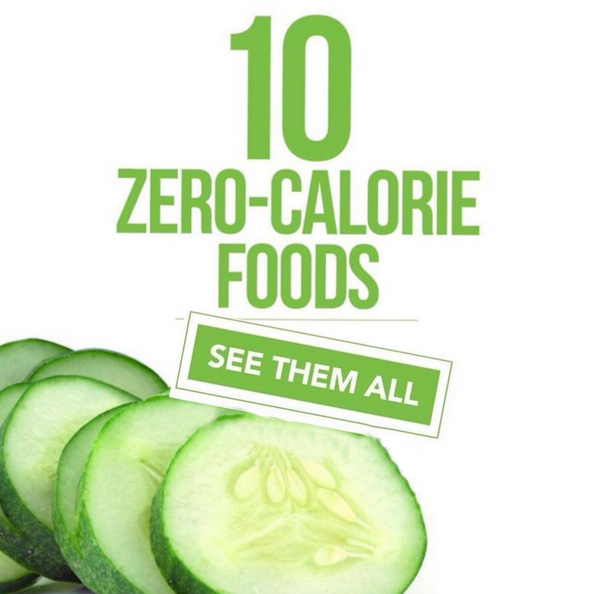 One cup of raw sliced cucumbers (with the skin) is only 16 calories. 5. Beets: Beets are truly a superfood. Dark purple goodness makes this root vegetable vitamin heaven. Good for so many conditions and ailments, beets can be eaten raw, steamed, grilled, etc. A 2-inch beet is only 37 calories. If you get bored of eating raw beets, try pickled beets. 6. Cauliflower: Delicious right out of the garden, 1 raw cauliflower floret has only 3 calories. 7. Tomatoes: A cherry tomato is like candy to a die-hard dieter. One cherry tomato is only 3 calories. 8. Parsnips: Parsnips right of the garden, placed in the pot to boil, and mashed, is a great alternative to potatoes. ½ cup raw, sliced parsnipsis 50 calories. 9. Zucchini: One slice of raw zucchini with the skin is only 2 calories. 10. Kale: Kale chips are a great option to unhealthy snack foods One cup chopped raw kale is only 34 calories.